Telegram, the messaging app launched back in 2013 stands as a rapidly emerging app even now on the Google play store. And those who are socially active and tech savvy, this name would be familiar to them. 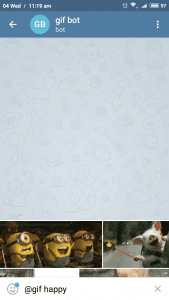 Apart from hassle free messaging, Telegram is filled with lots of creative, fun loving and useful features. 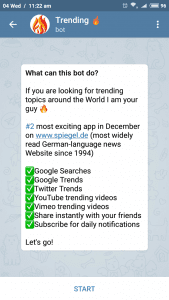 Cherry on the top feature which telegram before any other messaging app is BOTS. Moreover, Telegram was the first app in market to present encryption feature for enhanced conversation security. 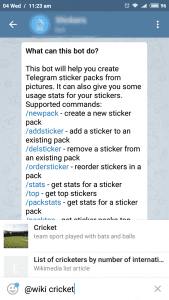 There is a catchy list of Telegram bots which are very useful and handy to the audience. 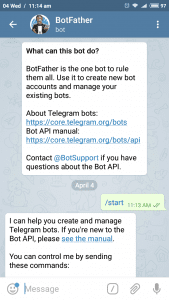 In June 2015, bots were introduced by Telegram which are technically a special Telegram account run by a nice and fine algorithms running via AI. As the name suggests, Bot Father is indeed the master of all bots as its main function is to reproduce a new bot. It also provides bot management system viz. you can organize all your bots from one place. The bot comes handy with a quick guide to creat and test new bots. 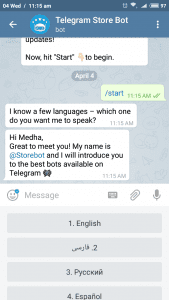 It can become a bit tough task to find out the bot of your need amidst hundreds of Telegram bots, Store Bot lets you relax here. 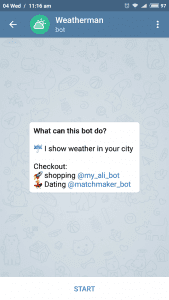 It is an official store bot from Telegram that aids you in exploring bots on this wonderful app. Whenever, there is need just type in @storebot and a list of top notch Telegram bots will appear right away. 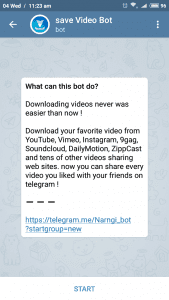 The best Telegram bot for all those people who are on the go. This will brief you about round the clock temperature predictions, sunset / sunrise timings, humidity score, etc of any city or town you want instantly. Additionally, the bot lets you set certain climate warnings so that your picnic plans don’t get ruined ever! No doubt Translator bot is amongst the favorite bot of the crowd. 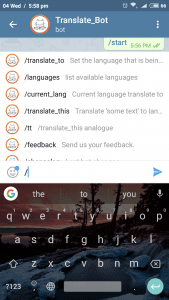 It translates your chat messages from one language to any other language just like a professional interpreter. Henceforth, the bot is most important for all the people who deal with international clients or have friends from another country. You may also use it as a quick alternative to discovering any new language of the world. 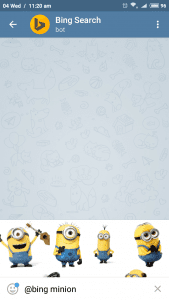 Who wouldn’t love a gaming add-on to any messaging app? 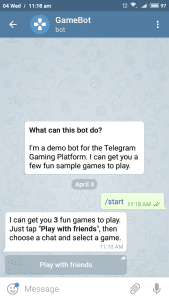 Why just chat with friends, enjoy the chat time having fun playing with them via Game bot. Choose either of the Math Battle, Lumber Jack and Corsairs. Don’t forget to try @gamee and @Gamee_bot along with this one! The Giphy GIF Search Bot is a latest amusement to all the Telegram users. The chat freaks who liked emojis very much are going to fall for @gif. In the middle of any conversation you feel like expressing via a GIF, then utilize this cool bot just by typing @gif and choose any already present GIF or create a one of yours and hit Enter! This Bing image search bot is the best option for people who are highly expressive in their chats. If you can’t find any appropriate emoji or sticker or GIF for your outbursting emotions, then simply type @bing in your search bar and enter a search query. You will see a variety of images popping up at your dismissal. Share the one you like instantly and have fun! 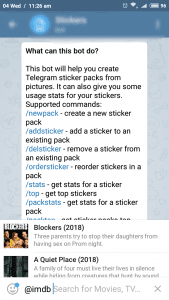 In the line of expression sensitive bots, this Stickers Bots has to stand out in the best Telegram bot list. This one is my personal favorite as it helps to create quirky stickers from our pictures directory. 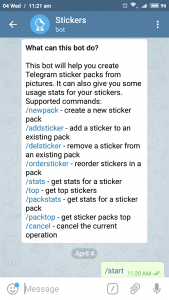 Also, the bot also provides statistical data for all the stickers created and used by you. This YouTube Search Bot simplifies the process of video sharing. Just liked a song video or any informational video on Youtube and you are eager to share it directly to your friends? Type in @vid on the Telegram talk and search / choose the video you would like to share with mates. These days, checking out “what’s trending?” is very trending itself. And we often think that how can we share a trending post to our circle. 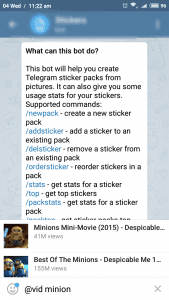 Telegram has resolved this issue by @NowTrendingBot. Via this bot you can not only see the trending pieces of your interest all over the world but you can also share them whether it is from YouTube, Twitter etc. Interested in Wikipedia searches and sharing knowledge? Yes. @wiki is for you. Just type @wiki your search and start learning. You can directly share these links with your friends also. @wiki is an inline bot so it can be accessed directly from the chat threads. Downloading videos is now much easier than ever. @SaveVideoBot can now help you increase your entertainment ratio by downloading your favorite video. Additionally, there are lots of options to find your entertainment like YouTube, Vimeo, Instagram etc. Also, you can even share these videos to your loved ones. 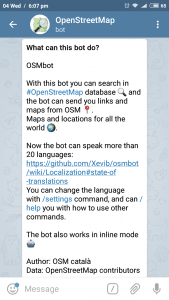 Using this bot, you can find any location in the world in OpenStreetMap database and it will provide you the map of the search. Presently the bot can speak in more than 20 dialects. You can choose your preferable language amongst them. 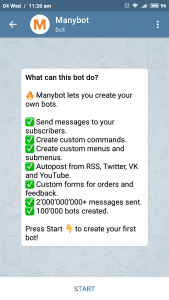 It is an impressive Telegram bot as it lets you to custom create your own bot. you can send custom commands, create menus and send messages. Just needed to press Send message and you are good to go. The bot will give you data about movies straight away from IMDB. All the information regarding your search will be in front of you within seconds. So if you are planning to go out for a movie but not sure about it, just open your Telegram and type @imdb movie name. And now you can make a choice easily. A Computer Science Engineer on papers and a blogger by passion. She likes to follows top trends in tech and media. Being a fitness freak is an advantage of hers!